In Achim Hochdörfer's article in the February 2009 Artforum entitled "A Hidden Reserve: painting from 1958 to 1965," the author names a number of painters included in this exhibition, "Whose practices are rich with implication." 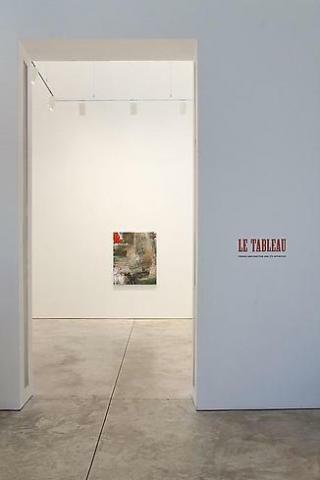 Le Tableau, continuing the conversation begun by Hochdörfer, attempts to expand his time frame historically, with a particular focus on the contribution of French abstraction from the post-war era through the present. There has been a longstanding rejection of French painting due to American triumphalism and a misplaced sense of competition by artists and critics of all stripes. French painting now seems timely in that the identifiably American notion of the "flatbed picture plane"appears banalized, having exhausted most options left for abstraction. Here, the emphasis is on the particular contributions made by painters identified with France and their exploration of the paintings' physical facticity, of surface as a "thickness," and/or other complexities of painted two-dimensionality. "Le Tableau" is a term commonly used by French painters and theorists involved in an interrogation of what constitutes the condition of the painting and/or of the pictorial. In the interest of a broad selection of French painting since WWII and contemporary works from Britain, the U.S. and elsewhere that is perceived as having parallel concerns, works have been included that some might consider more peinture than tableau. Much of the work selected places emphasis on the material means and/or structure of painting as a form or figure. Writing on post-war French painting, Clement Greenberg criticized "their surfaces with buttery paint and films of oil and varnish. "i His observation was indicative of French paintings' continuance of tradition, but also of a desire to think and work with the givens of the conventional painting's complexity. This contrasts with Greenberg's dictum involving flatness, "purity" and a priori American reading of the painting as a tabula rasa or virginal plane. Artists associated with the Ecole de Paris in the period Greenberg was writing (1953) such as Fautrier, Hartung, and Riopelle used the aforementioned picture-making substances to negate the traditionally resolved painting. These French contemporaries of the Abstract-Expressionists were involved in a dismantling of the picture-object that at moments resembled an evisceration of the very body of the painting. This differs from the American project that tended to reduce painting to a single trope. (Still: the palette-knifed passage, Pollock: skeins of spatter, Rothko: sfumato, etc.). In a paper delivered at the Courtauld Institute on French artisticii practice the painter Mick Finch translated a fragment of a Hubert Damisch textiii on how Dubuffet "liked working in the thickness of the ground—I mean the tableau—to reveal what is beneath: scratching the paper, incising and beating up the substance, skinning it and whipping it up to reveal layers below." Finch cites this description as a working of the surface as a "material entity in itself." This negation of the authority of the painting can be seen to reaffirm the haptic connection with the viewer. Jean Fautrier wrote, "in front of a painting that we like completely, there is a physical need as well as its fulfillment. "iv Not dissimilar is Samuel Beckett's paradoxically recuperative practice that undermined conventions of language and representation. Beckett viewed language as "a veil that must be torn apart in order to see what is behind it. "v Later works included have a more formalized approach to practicing the tableau and might be best contrasted with the American orientation by using an example outside of painting per se: nearby the gallery, on opposite corners of 19th Street and the West Side Highway, sit two almost exactly contemporary buildings of not incomparable height and dimension. The Frank Gehry building on the southwest corner is immediately recognizable, branded with Gehrys' look of twisting & morphing walls. The patterned, semi-transparent glass surface of the building is general throughout the exterior. As the building meets the street there exists a kind of vacancy. It has a strong, yet oddly holographic presence in its tenuous acknowledgement of its support, the urban ground. Across the way the Nouvel building has a less trademarked look but a more complex interaction with the street. The exchange that takes place between inside and outside has been considered. The exterior structure doubles itself, extending from the main body of the building. Questions of interior/exterior, depth of the window walls and mass is collected in combinations of variations. Nicolai Ouroussoff wrote that "...the punched-out windows and ragged corner also suggest an erosion of the boundary between the public life of the street and the guarded, private realm inside. "vi Applied to painting, the French/continental definition of the surface of the painting is a transitional site, a retinal, conceptual, haptic, situation that the viewer moves through, the way the pedestrian moves into the body of the Nouvel building from the street. (The painter Simon Hantaï, writing on his own painting, noted how "The canvas ceases to be a projection screen, becomes a material, cutting within itself, etc. ").vii One reads the Nouvel building part-to-whole more slowly as opposed to the speedy, signatory acknowledgement of the Gehry building. Jean Fautrier wrote that he wanted to "dynamite" the painting. Fautrier's facture seems to thwart the expectations of the viewer. As if the tableau were a mattress, he unstuffs it, piling thickly ridged plaster on the surface of his paper-covered canvas and coloring it with transparent liquid media. The background seems to bloat while the figuration melts across it in thin, candy-colored washes, a derisory artifice. Hans Hartung amalgamated various contradictory methods, such as his tendency to color only the background plane and impose contour lines or clusters of studied brushstrokes or spatter over it, scoring the paint when wet and scratching into dark stains. There remain various drying charts in his studio of generously laid down oil pigment onto which Hartung incised long curves. The charts give indication of the quality of line produced by various states of dryness, 15 minutes, 30 minutes, etc. Hartung, like the painter Jonathan Lasker, was a great rehearser. His studio studies indicate the determination to craft a painting towards a slower perception of depth of surface. Jean-Paul Riopelle, after examining a painting by Jackson Pollock, said, "Far from sharing a common cause, we are directly opposed. "viii Riopelle's densely palette-knifed, obdurate, multifaceted tableaus were far away from the lyric impressionism of Pollock. Riopelle took the greasy, full spectrum of artist's oil paint, and trapped inside the material limitations of recalcitrant whites, transparent emeralds, ivory blacks and other difficult, unpromising compounds, built a continuous surface. Interlocking planes dominant in the compositions of Serge Poliakoff's tonally modulated, heavily reworked planes are so elegantly honed that they seem to be two-sided, more like shards than painted passages. Ellsworth Kelly, who practiced in Paris early in his career, most likely developed an awareness of Poliakoff's relief-like, organic/geometric leaf shapes, their strong deliberative color and quiet impersonality are much in evidence in Kelly's relief pictures. The aforementioned painters were considered part of the movement variously referred to as Informel or Tachism—painting in absence of any premeditation, conception or approach—that dominated Paris in the 1950s & early '60s where Joan Mitchell resided and maintained a dialogue with its artists. Informel reconfigured the painting through a particular attentiveness to its inherent structural characteristics and materiality. The tesseral gathering of Mitchell's brushstrokes, like Riopelle and Poliakoff, demonstrate her conversance with their aims, as does Mitchell's consistency in maintaining an exposure of the raw canvas support. Mitchell can be seen as an insouciant semiotician of the painterly mark, collecting examples from paintings past and present as she carefully disorders them upon the canvas in dry array. Milton Resnick, an American immigrant who spent time in Paris and befriended the Tachist visionary, Wols, had a ruminative, grasping painterliness that seemed to reveal itself as an outgrowth of the ground. Resnick was the earliest of the abstract expressionists to acknowledge Monet. He saw the ugliness of the impressionist painters' brushmarks as prescient. Similarly, the heaviness of Louise Fishman's rusticated gestural marks and resulting surface richness impart an odd efflorescence, produced from an intuition that what once was expressionist facture could become intimist, according to one's attitude. Fishman's particular success comes from within proscribed limits but evidences the means at arriving at an encompassing and complete statement. Martin Barré was originally considered a part of "abstraction lyrique," but more quickly absorbing the lessons of the work of Yves Klein than his contemporaries, he began an investigation of the objective reality of the picture-object, the mark's contextual relation to the field and the exposure of the support. Barré was preoccupied with the bonding of surface incident to ground, and his sprayed works can be seen as the mark that most economically bonds figural gesture to textural support, compounding the comprehension of surface dimension. The American painter Kimber Smith, a Paris resident for approximately half of his painting career was of the same generation as his close colleague Joan Mitchell. Smith's work distinguishes itself by its feathery touch, economy of means, clarity of construction and bright color. His vocabulary of quasi-geometric delineations, squeezed-from-the-tube linear meanderings and brushed, notational, and incomplete forms, defied category. Despite a lack of consistent gallery representation or critical support when he lived in Paris and later in New York, his work shows great inner strength and creative self-confidence. Revisionist narratives of art history related to abstract painting in the 60s and 70s have already begun to assert the importance of his contribution. ii	Supports/Surfaces: Contexts and Issues by Mick Finch Supports/Surfaces: Critiques of Modernism Conference paper. Courtauld Institute, Saturday February 27, 1999.
v Beckett, letter to Axel Kuan, trans. Martin Esslin, Disjecta: Miscellaneous Writings and a Dramatic Fragment, ed. Ruby Cohn (New York: Grove Press, 1984), pp. 171-73.